Whether Parsifal is a supremacist scripture or a mystic journey, we are used to seeing at least one appearance of the Holy Grail or Spear. Wagner, a man of the theater as much as a composer, left clear indications in his libretto about when and how these objects should be deployed in his “consecration” of the Festspielhaus stage in Bayreuth. Danish directing team Hotel Pro Forma, whose new production of Parsifal premiered at the Poznán Opera, in western Poland, on October 18, sets out to spurn the notion of Art Religion and reframe the opera in more immediate, human terms. Despite some inspired touches, the concept goes so overboard as to obscure the story’s fundamental interpersonal relationships. While Parsifal, dressed in a mod, eighties-style jumpsuit, his fingertips lacquered in white paint, is assigned a Doppelgänger who mimes his lines in sign language, Kundry—an unemotional, bourgeois apparition—is represented by a dancer in different guises. In the climatic seduction scene of the second act, the singers barely make eye contact. Instead, Kundry’s powers are implied with the dancer’s brief undulations in a leotard. After the Pure Fool foresees redemption for her—Erlösung, Frevlerin, biet’ ich auch dir—a crucifix is erected in the background, draped with a white coat, while he stares into eternity. Upon the return of the warlock Klingsor, there is no spear. Instead, a giant meteor descends, crashing the metal skeleton of a non-descript house. Presumably, this represents the magic garden which disappears when Parsifal waves the spear in the sign of the cross. Or is it just the power of the supernatural. The disorienting visuals at times served to propel the action through what are arguably long-winded passages. 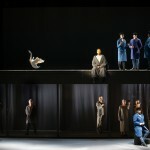 Pro Forma Director Kirsten Dehlholm, staging Wagner for the first time, set the narration of the knight Gurnemanz during the first act to tableaux vivants such as the image of businessmen huddling on one side while modern women facing downstage gave the Hitler salute on the other. One would have wished for more from the flower girls of the second act, here set in drab yellow dresses (costumes by Henrik Vibskov) above moderately interesting video projections. Dehlholm takes a near surrealist approach to the character of Titurel, father of the wounded knight Amfortas, casting him as a black-faced, spandex-clad ghost from the very beginning (he is in fact still alive in the first act). The unveiling of the grail in the final scene is represented by extras hanging on swings above lowered stage platforms—a vision of innocence and new beginnings (with expert lighting by Jesper Kongshaug). The production, despite its far-fetched symbolism, was not out of tune with the vicissitudes of the score, such as with a mass of people marching in darkness during the tolling bells of the final scene. The orchestra under recently-installed Music Director Gabriel Chmura, a surprisingly young group of musicians, struggled with the sustained, shimmering lines of the opening act only to improve steadily throughout the evening, bringing clear dramatic intention and vigorous energy to the score’s intricate melodic fabric. In the cast, German tenor Thomas Mohr gave a polished, penetrating performance of Parsifal even as he lost himself in the sea of Regie. 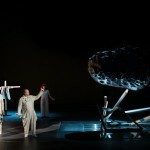 He was well-matched by the dark, resonant soprano Agnieszka Zwierko in the role of Kundry; one can forgive her at times harsh timbre and tendency to go flat in their heated exchange of the second act. Mario Klein was a suitable Gurnemanz—although he at times struggled to end his lines audibly above the orchestra despite Chmura’s excellent balance—and Mark Morouse gave a touching enough account of Amfortas, trapped in a wheelchair until he is healed by a piece of asphalt (picked up by Hotel Pro Forma from the giant construction site that currently engulfs the center of Poznán). Jerzy Mechliński was a strong voiced Klingsor, shrouded enigmatically behind primitive, black make up, and Krzystof Bączyk made for an athletic Titurel—perplexing as it was to see him dressed in a unitard. It is something of a milestone for the house to have staged Parsifal with an international cast and a production as unconventional as that of Hotel Pro Forma. Despite the direction’s admirable attempt of transforming an opera with potentially lethal ideology into a universal allegory, Dehlholm also found herself subject to its mythic weight—leading the audience down the road of her own bewilderment. This entry was posted on Thursday, October 24th, 2013 at 7:34 am	and is filed under Berlin Times. You can follow any responses to this entry through the RSS 2.0 feed. Both comments and pings are currently closed.